I'm here with another wallpaper! Ah, this is the first Prince of Tennis wall i've seen being submit into MT o.0 But i know there are a lot here..
OMG !!! So cute !!! I love this wallpaper !! Good work !!! Both of them are so cool !!! So kaku-i !!!! Awesome work !!! Thank for sharing !!! kaidoh and momo-chan!!! my two favourites!!! this is an awesome wallpaper!! Momo and Kaoru is a great couple!! Momo/Kaidoh! 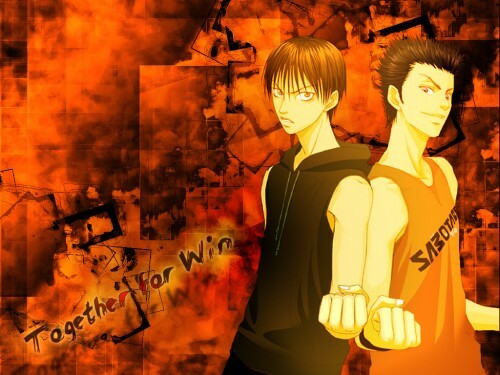 I like them more than Inui/Kaidoh! very good wallpaper^^I like the expression in kaidoh eyes. Momo and Kaoru is a great couple!